Lock in a great price for Hotel Porto Roca – rated 8.7 by recent guests! The hotel and staff were wonderful! After spending 3 days exploring all 5 villages, I wouldn’t stay anywhere else. Hotel Porta Roca was absolutely wonderful, my family and I had an amazing stay. The views are unbelievably beautiful - and the balcony from our junior suite was gorgeous. The breakfast buffet is fully stocked and is delicious. The staff is very helpful and friendly, and speak great English. The restaurant at the hotel is superb, and our dinner there was one of the best we had all week. The maid services come twice a day to bring you fresh towels and turn down the beds - we paid 18 euros extra and they did our laundry and even folded it beautifully! Highly recommend this hotel, we had nothing but wonderful things to say about it. 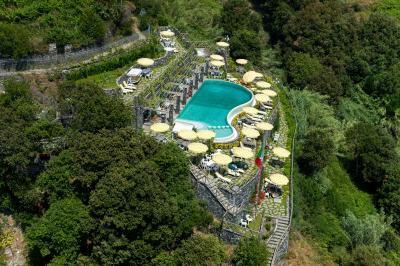 If you can stay at Hotel Porta Roca - DEFINITELY do it! You will not be disappointed. The views, the food, and the staff make this hotel absolutely unmatched. A free taxi service even came to pick us up from the train station. We will surely be back! The breakfast included in our stay was wonderful with a wide variety of hot & cold European options including champagne. The restaurant service and the entire staff were very pleasant & attentive. Above all, the superior location of this property and our waterfront balcony view made it extra special. Everything! I would definitely come back! I’m a picky person! Staff was amazong! Cleanliness a 10! Location UNIQUE! Views AMAZING! Spectacular location and views. Great facility. Love it! The staff was great. The location is breath-taking. The rooms are comfortable. The pool is beautiful. The transport is really convenient. Everyone is attentive. Breakfast buffet is great. Ruth at the front desk was exceptional...kind, professional & knowledgeable. I had asked every person I met when the Lemon Festival was (even the people in the lemon shops) & no one knew...but Ruth knew! The restaurant was run like a finely tuned orchestra...amazing! Desserts were a sight to behold! Breakfast was GRAND! Breath taking view. Breakfast was fabulous. Staff was friendly & helpful. Made our stay in Cinque Terra the best vacation ever!!!! Hotel Porto Roca This rating is a reflection of how the property compares to the industry standard when it comes to price, facilities and services available. It's based on a self-evaluation by the property. Use this rating to help choose your stay! 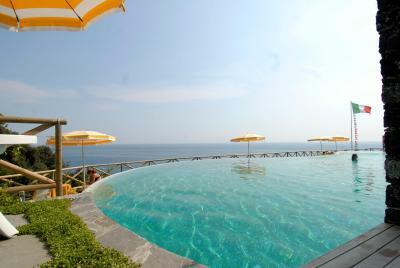 Hotel Porto Roca offers a panoramic cliff-top location with stunning sea views, a 5-minute walk from Monterosso center. 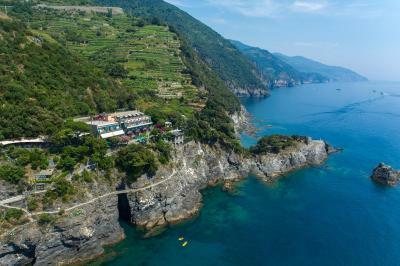 The Cinque Terre's famous Blue Trail starts here. 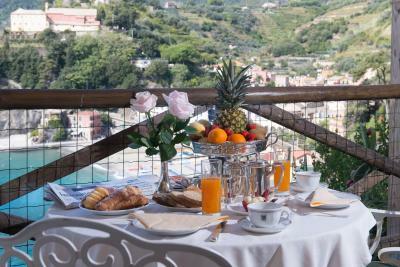 Porto Roca is an elegant villa with pretty gardens and terraces overlooking the Ligurian Sea. 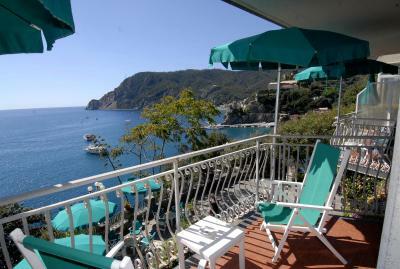 The hotel also offers free chairs and parasols at the beach below. 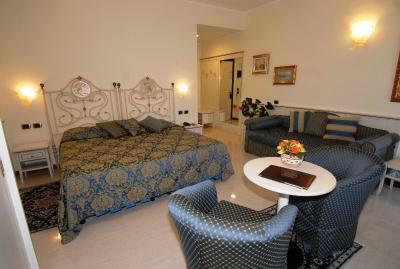 Rooms feature classic décor and come with air conditioning and satellite TV. 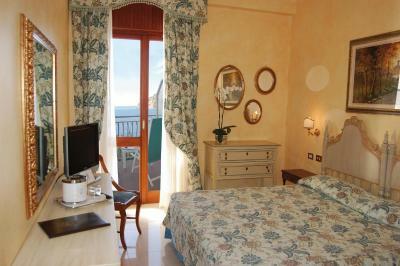 Many have a private balcony overlooking the sea. Wi-Fi access is available throughout. Porto Roca's restaurant overlooks the sea and the beach below. 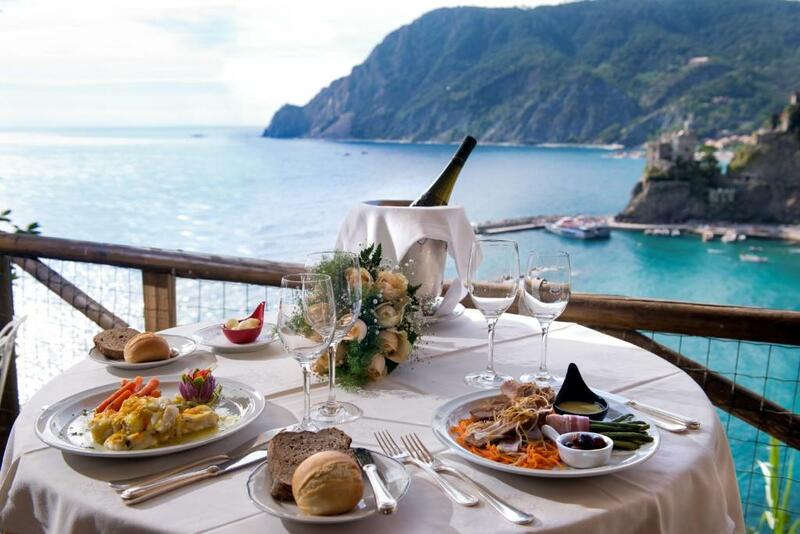 It serves a buffet breakfast and freshly-caught fish and Ligurian dishes for lunch and dinner. 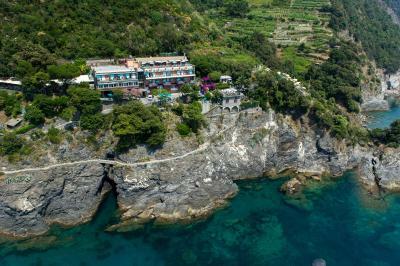 A free transfer service is available to and from Monterosso Train Station or car park on arrival and departure. When would you like to stay at Hotel Porto Roca? 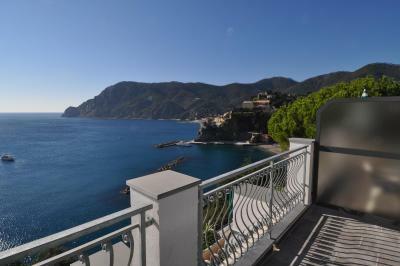 Features a balcony overlooking the Ligurian Sea. Wi-Fi is free. Air-conditioned room with private bathroom and satellite TV. Wi-Fi is free. Please note that this room faces a wall. With a double sofa bed in the separate living area. Wi-Fi is free. 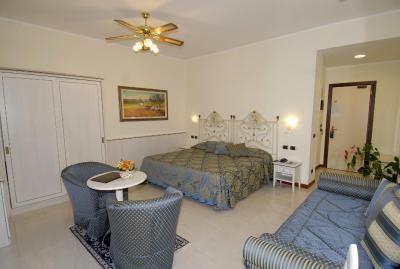 Smaller room with a small double bed, air conditioning and satellite TV. Wi-Fi is free. House Rules Hotel Porto Roca takes special requests – add in the next step! All children under 2 years are charged EUR 26 per night in a crib. Hotel Porto Roca accepts these cards and reserves the right to temporarily hold an amount prior to arrival. 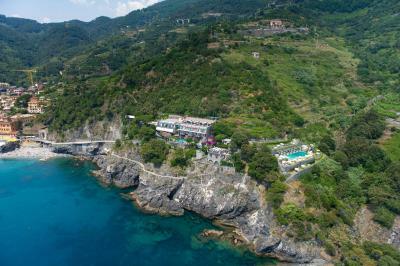 When using a GPS navigation system, please enter Via Fegina 104, Monterosso. Free shuttle service from the town center to the property is provided. 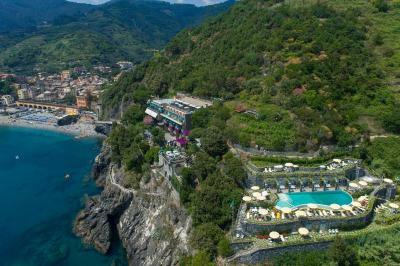 Please contact the hotel once you arrive in Monterosso. Free access to the private beach area is included from 01 June until 30 September. The staff was excellent, very friendly. The food in the restaurant was terrible. I had a crepe for dinner which tasted like cardboard and had clearly been prepared sometime ahead of service. We were a group of seven and not one person enjoyed their meal. Our room smelt damp and the bed was extremely hard and uncomfortable. When we went to the bar for a drink they had run out of everything we wanted. It was quite expensive for something that only offered great views but was a disappointment in many other areas. For this reason I would never stay there again. I feel the Hotel Porto Roca misses many opportunities to impress their guests. They seem to be relying on location only. Such a pity as it really is a spectacular part of the world. It would have been nice to be able to use the hot tub and/or pool after 7pm. The outdoor setting of these is so beautiful that it's a shame to miss the moonlight experience. nothing it was all great!